Saturday July 25th, was one of those deliberately beautiful summer afternoons that simply demanded acknowledgement. The sun was soft and bright, the air cool and crisp with ever so gentle and consistent breezes that dared you to roam indoors. 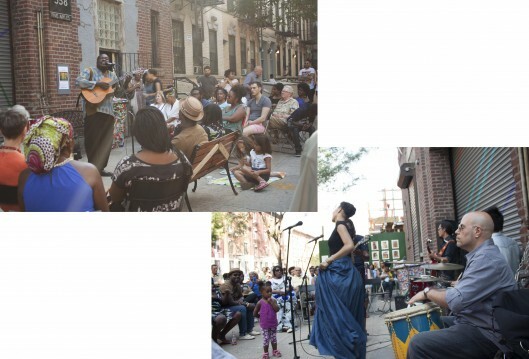 Thus, it was the perfect day for the HCX community gathering outside of Five Myles Gallery in Crown Heights for Krik? Krak! : An Evening of Music and Stories, part of the HCX Mizik Ayiti Concert Series. The afternoon began with Haitian folk stories read by singer and artist Riva Nyri Précil. The children in the audience sat memorized, watching the beautiful lady with her fairy godmother-like presence, tell tales of mystical proportions set in a far and away yet somewhat familiar land. Riva’s stunning voice gave life to the songs and refrains from the various folktales: Tezen, mon ami mwen-zen. Tezen nan dlo, mon ami mwen zen – the story of a magical fish and a young woman’s love, and Ensel Badyo, a Cinderella-like tale. Following the stories, kids and grownups alike, were treated to songs from Précil’s new album, Perle de Culture. Curious passers by found themselves drawn by her renditions of “Damballah“, “Se Bon” and “Twa Fey”. As some of us surrendered to the music, others communed over refreshments of Prestige, Cola LaCaye and assortments of Haitian “Patés”. The highlight of the evening, however, came by way of musical tour-de-force, Wooly Saint Louis Jean. The humble, jovial, giant of an artist known for putting the works of Haitian poets, such as Georges Castera and Syto Cavé, to song had come to town and wanted to collaborate with HCX. Director Régine M. Roumain wasted no time and was absolutely psyched to host one of the artist’s rare performances stateside. Wooly, along with his trusty guitar, performed subtle, tender and sometimes melancholic songs. Above all, we jammed with him in nostalgia, euphoria and most importantly dance. He sang works of his own and sang works of his friends, throwing in some classics as he sought fit, at one point, even pulling up his young and timid daughter for a sweet and poignant father-daughter performance. Perhaps it was the warmth of the audience or the inquisitive nature of the new friends coming off the sidewalks to join our gathering. Some might say it was the gorgeous weather and mischievous setting of the sun over perfect acoustics or maybe the power of the artist collective. I say it was all this and a more. Whatever the case, we all recognized the magic of the moment and not one of us wanted it to end. This entry was posted on Wednesday, August 5th, 2015 at 5:20 pm	and is filed under Archive, Events, HCX Programs, Krik Krak, Music, Weekend. You can follow any responses to this entry through the RSS 2.0 feed. You can leave a response, or trackback from your own site.